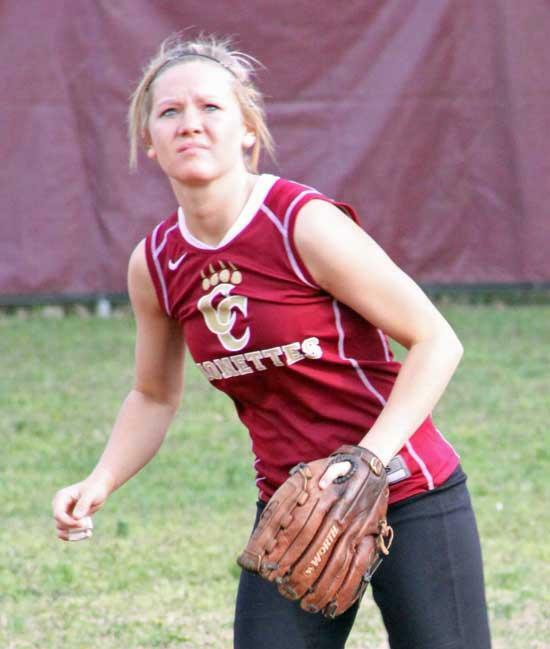 Lionette softball player Emily Sissom looks to make a play in a recent game. Sissom pitched a no-hitter against Straford in the Cannon Co. Classic Softball Tournament. Emily Sissom pitched a no-hitter and Cannon County's offense exploded for 14 hits in a 17-0 win against Stratford in the Cannon County Softball Classic Saturday (April 2). Sissom struck out five in securing the no-hit feat. "Emily was strong on the mound and has been a strong addition back to our team," Cannon County Head Coach Matt Cagle said. "She took last season off to concentrate on basketball, but she has come back strong this season." Sissom maintained mental toughness and focus despite the one-sided game to keep Stratford at bay. Sissom was also a strong performer at the plate, going 3-for-3 with a home run and two doubles. Shelby Jordan was 2-for-2 with a double and two runs scored. McKala Rollins was 2-for-2 with three RBI and a double, Elaine Greer was 3-for-3 with four RBI and a double and Madison Simons was 1-for-3. The Lionettes also turned back future District 8-AA foe Central Magnet 10-9 in the Classic. Jordan, Simons, Nichols, Lindsey Reed and Sissom each had two hits in the winning effort.